In the wake of warnings from city and state officials about an impending and “historic” snowstorm, New Yorkers dutifully prepared for the worst. Grocery store shelves were emptied. Cars were banned from the roads. Even public transportation was shuttered. The problem? For much of New York City – as well as New Jersey and Philadelphia – the “storm of the century” never materialized. On Tuesday, most New Yorkers woke up to snowfall that measured in inches – not feet. The subways and buses were operating again, and many wondered just what all the fuss was about leading up to the blizzard. Various parts of New York City saw between four and 10 inches of snow. In New Jersey and Philadelphia, where more than a foot of snow was predicted, just three to five inches fell. “My deepest apologies to many key decision makers and so many members of the general public,” tweeted Gary Szatkowski of the National Weather Service. In light of the relative lack of snow, New York Governor Andrew Cuomo came under fire for his decision to shut down public transportation for the first time ever due to a snowstorm. A report from the Brooklyn Paper stated that empty subway cars continued to run regardless of the ban due to the time, money, and inconvenience required to store them at far-off locations. Still, while some parts of the East Coast may have been spared, the “historic” blizzard lived up to its billing in many other areas. 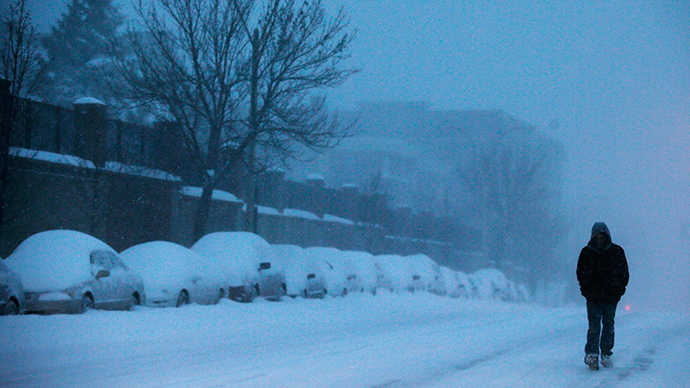 Massachusetts, Connecticut, and Rhode Island were all blasted with heavy snow. Much of Massachusetts was blanketed, with most of the state receiving some two feet of snow, according to AP. In Auburn, Massachusetts, more than 32 inches of snow accumulated – and the snow was still falling on Tuesday. In Thompson, Connecticut, just over 30 inches of snow fell, while Burrillville, Rhode Island dealt with about 24 inches, NBC News reported. Not even all of New York was granted a reprieve; Long Island experienced nearly 29 inches of snow, according to the Washington Post. Outside of snow, flooding was also a major problem for some towns along the coast. Some parts of Massachusetts saw 7 feet of water as the blizzard pounded homes with winds not typically seen unless during a hurricane. The town of Marshfield saw nine homes severely damaged due to flooding, and thousands of people in the state are in the dark thanks to power outages. "There is about 4 feet of water in the street in front of the house," Eric Murphy, a pest control worker, told NBC Newsfrom his home in Marshfield, Massachusetts. "We do get flooding here, but this is the worst I've seen in the 15 years I've lived here. My house is on stilts, but another few inches and we might be in trouble." "We have a lot of damage from the high tide last night, a lot of high winds," Marshfield Fire Captain Shaun Robinson, who inspected the damage on Tuesday, told WHDH in Boston. "The pilings on the front of the buildings literally were snapped." No matter how much snow fell, though, some meteorologists were quick to note that accurately predicting snowfall remains a tricky business. Even a small change in weather patterns could mean far less precipitation for some regions – a reality that clearly affected areas such as New York City and Philadelphia. Yet Snowmegeddon hysteria gripped most of US media.